So I’m super late on this bandwagon, but I’m in love with the Wet ‘n Wild Megalast Lipsticks! I held off on trying these because I heard that since they’re matte, they’re a bit drying on the lips, and anything that’s even a tiny bit drying will completely dry out my lips halfway through the day. But recently I started looking up swatches, and finally I thought I’d risk $2 and try one out. After trying one, I went out immediately and got a few more — they’re THAT good! The first drugstore I went to only had about three shades, but not surprisingly Stoplight Red was one of them, and I really wanted to try it. What better way to test a lipstick line than to go for a bright, classic color like a matte red? It went on smoothly and didn’t actually look matte right away. It definitely transferred pretty badly, but it lasted ALL. DAY. I couldn’t believe it. This is a beautiful orange that I think could pass for a fall color (I’m definitely going to try!) in addition to being a great summer staple. I swatched it on my lips and it went on really smoothly. It seems like one of those shades that will suit most skin tones, as it’s closer to red than an in-your-face flourescent orange. This color is definitely spring/summer, but I did sneak it on today since it was so beautiful outside, and it’s a perfect bright orange-coral. It dragged a bit going on and was completely matte, so it’s a good idea to use a balm underneath and bring one along for touch-ups. I thought this shade wouldn’t last as long as Stoplight Red since it’s so much lighter, but I actually didn’t even touch the tube all day! Every time I checked on it I’d turn to my boyfriend and say, “I’m still wearing lipstick!” I’m so excited to get more use of this once it’s back in season. I’m not usually into light lipstick shades, but I thought this one might suit me well enough. I swatched it on my lips and it definitely came off more lavender than mauve, though, so unfortunately I think this one won’t get a ton of use for a while either! But it’s literally the only lavender that I think looks good on me, since my lips are fairly pigmented on their own. I swatched this shade on my lips, and WOW is it dark. It went on just as smoothly as the others, and it only took one swipe to get the full color on. I’m not sure how often I’ll get to wear it, but it’s an amazing color. I might layer it underneath MAC’s Rebel to give it a little more brightness. I bet you could also pat this on with your finger to get a subtle stain. Like it says in the title, I’m obsessed with these lipsticks! I can’t believe they’re only $2 each. They’re so pigmented and long-lasting, and you get quite a bit of product, too! It won’t be long before I end up with almost the entire line. My only issues with these lipsticks, and they’re small, is the packaging and shape. The product doesn’t twist all the way into the casing, so while this is good for choosing shades, it’s not good when you have to pull off a clear plastic cap! If I ever need to use one of these in a rush, I’ll probably knock off a whole corner of it. I also think the shape of the product itself is good for getting a lot of product on quickly, but it’s difficult to be precise with it. I think they have a pretty good color selection, but it seemed like about half of them look really similar. There are a lot of pinks, especially light pinks. I’ve also run into trouble finding all of the shades. One drugstore had three options, another about nine, but of course not many of those were the shades I was looking for in the first place. I think I’ll have to try and find larger drugstores or order the rest online. Thanks so much for taking the time to read my blog! Have you tried these lipsticks? Which is your favorite shade? I have the mauve one and I was surprised by its staying power as well! I definitely want to try more shades! I would definitely recommend grabbing another one or two and seeing how you like the different shades. They seem to be slightly different textures depending on the shade. I love them, too! 🙂 I got 4 shades and hope I can get my hands on 24 Carrot Gold and Purty Persimmon one day. Today I’m wearing Red Velvet 🙂 Sugar Plum Fairy is also a great shade for fall (I reviewed it on my blog). I highly recommend those two shades! They look really similar in the tubes but very different on, so don’t be alarmed when you pick them up. I considered Red Velvet but couldn’t find it…I’ve also heard Sugar Plum Fairy is a dupe to MAC’s Rebel, which I already own, so I’m not sure if I want to get it. 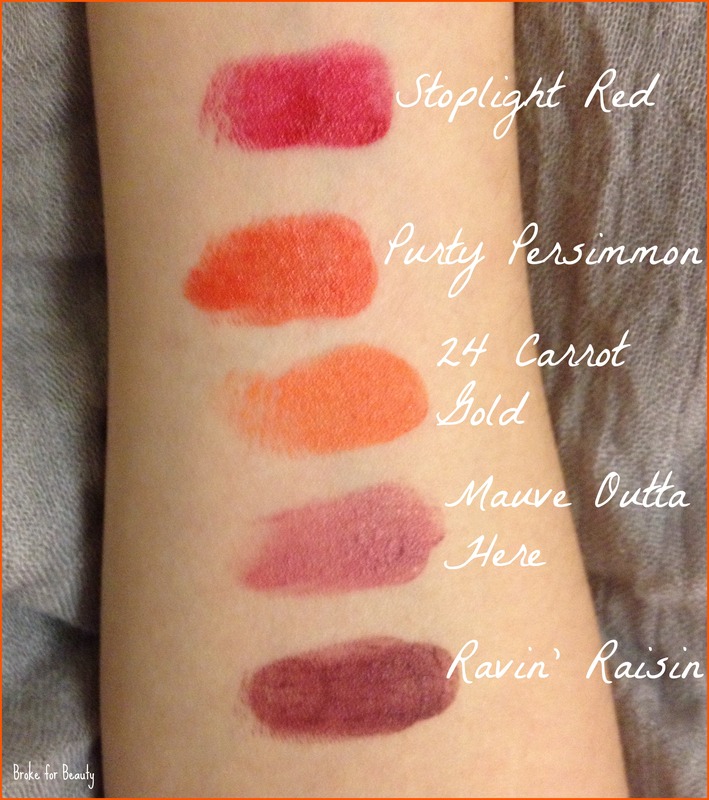 I am obsessed with these lipsticks and am actually planning on doing a post swatching all that I have soon also…I have waaaaay too many! They are just so inexpensive and perfect!